The shirt is gorgeous. The sizing is perfect. I LOVE it! Now that I own one I plan to buy shirts as gifts. I would like to see larger sizes so that plus size people can be included. I haven't washed my shirt so I can't speak on shrinkage, wear and tear or fading. However I do think it will do just fine. I would like to see more items offered like yard signs, hats, car magnets, keychains,, stickers, banners etc. I love this!! It’s high quality material (not crazy thin like most flags) and the perfect gift for my husband. 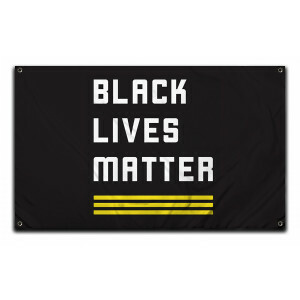 We’ll be hanging it in our garden where we host BLM committee meetings, he’s going to love it.